The latest property market report from RICS reveals severely reducing supply as tax take hits landlords hard across the UK rental market. Purplebricks has doubled the number of shares it needs this year to incentivise staff and LPEs to do the long hours. 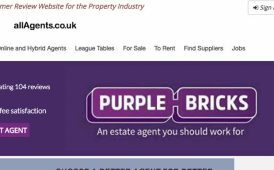 New trade body failed to gain enough support from independent agents or serious momentum, forcing it to close on 31st March 2018.
Review site is successful in proving its ‘independent’ status, as used in its advertising and marketing, in a case involving negative Purplebricks reviews.